Like every other line throughout the country, the Dursley branch had its share of local characters, without whom the line would have been a much poorer place. Looking back it is amazing just how many staff were needed one on one short line, with just three stations, to keep everything running smoothly and efficiently. 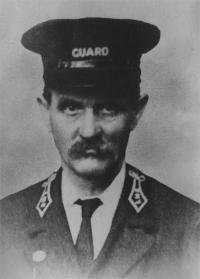 The range of jobs was wide; stationmaster, porter, clerk, guard, signalman, driver, fireman, carter - the list goes on. Each had their part to play and each depended on the others to help keep the operation going. 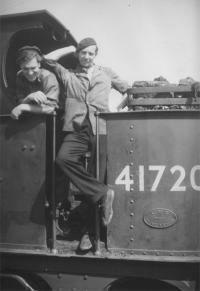 Driver John Humphries (left) and his fireman Nigel "Badger" Davies on the footplate of Johnson 1F 0-6-0T, 41720, a regular performer on the branch line to Dursley. When the passenger traffic finished in 1962, John transferred to Gloucester shed and drove some of the crack expresses on the main line, including the "Cornishman". Bernie Thomas (junior porter), David Allies (Passenger Clerk), Arthur Layzell (Chief Goods Clerk) and Charles Lewis (Stationmaster). Having a brief rest at Dursley are junior porter Bernie Thomas, Coaley leading porter Walter Price and Howard 'Pat' Paggett, a passenger porter from Charfield. Behind them is a stack of Lister benches awaiting shipment by rail. 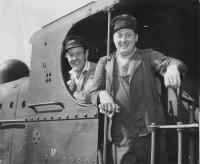 Dursley shunter, Roy Brain, and Gloucester based engineman, Eric Ford, in the cab of 43593 at Dursley. Station master Walter Sidney Warren is seated left. Also shown seated is Bert Pegler. Standing, 3rd left, with the moustache, is John (Jack) Johnson, the railway guard who was killed in the tragic crash at Charfield in 1928. This photograph shows the number of staff employed at a single small branch line station. Station master Warren is seated, 2nd from the left. 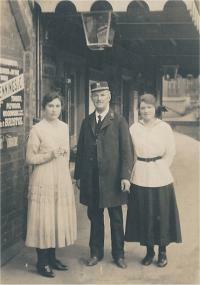 Station master, Walter Sidney Warren, with two of his daughters on the platform of Dursley Station. When he took up the post at Dursley in 1901, the staff consisted of two clerks, one station porter, one goods porter, one parcels porter, two guards, a drayman, two drivers, two firemen, a steam-raiser, a gang of platelayers and one horse. Mr Warren continued to be in charge at Dursley until his retirement in October 1923 and then went on to enjoy a very long and happy retirement in Uley until his death in 1958 at the grand age of 100. 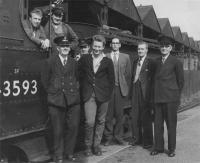 Station master, Walter Sidney Warren (left), stands on the platform of Dursley Station, accompanied by some of his staff. On the right are some of the early wooden carriages which were used on the line at this time. 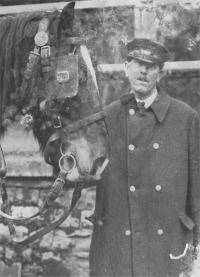 London Midland Scottish Railway carter, Bob Harris, with his horse Dolly. Mr Harris had a flatbed wagon which Dolly would pull all around the town, delivering goods from the station to the various shops. He would stack the goods on the pavements outside the shops, either by hand or using a small sack trolley. LMS guard, Jack Johnson, based at Dursley. Mr Johnson was unfortunately one of those who lost his life in the crash at Charfield station on 13th October 1928 when, at about 5.20am, the 10pm LMS Leeds to Bristol mail passenger train steamed at a steady 60 mph through the dense fog and collided with a GWR freight train that was being shunted on to a station siding. The mail train was then thrown by the impact into the path of an oncoming LMS freight train and a terrible fire ensued. 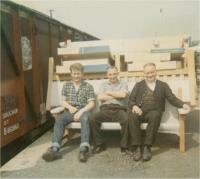 Mr Edwin (Ted) Spilsbury pictured here, was for many years the guard on the Dursley to Coaley line. He was also at one time a Parish Councillor.